Want a grab and go delicious breakfast that will have you not missing your favorite bakery? 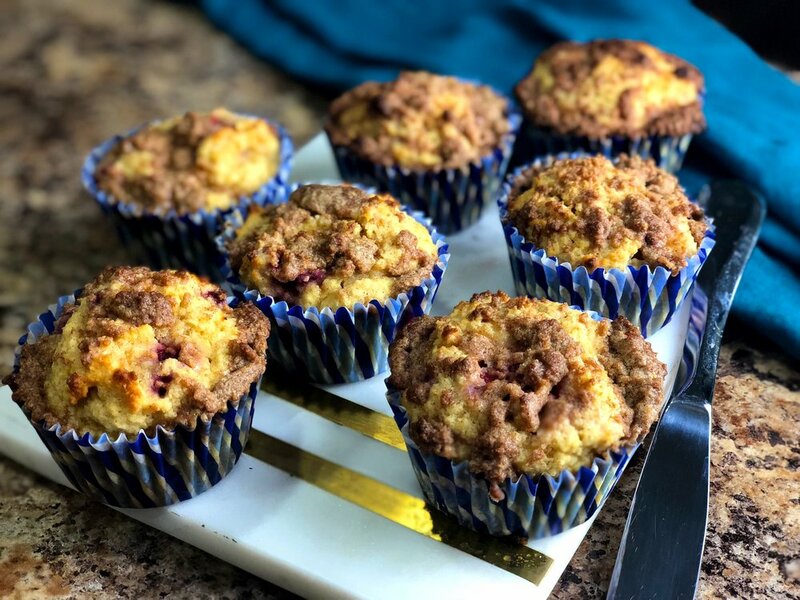 Try my DELICIOUS Lemon Raspberry muffins! The streusel topping is to die for! What’s the. Eat muffin/pastry you want to see keto-fied? 1. Preheat oven to 325F and line a muffin tin with muffin liners. 2. Combine sour cream, lemon(zest and juice), cream cheese, eggs, and imitation vanilla in a large bowl. Blend about 30 seconds on high with a stand or hand mixer( a blender works as well). smooth. If your batter is overly thick, add 1/4 cup of water to thin it out. 4. By hand, stir in raspberries(I used frozen ones but you can use fresh also). 5. In a separate bowl combine the streusel toppings and mix(it will be clumpy like the topping on a coffee cake). 6. Divide the muffin mixture among the prepared muffin cups then top the muffins with the streusel topping and bake 25 to 30 minutes, until just golden brown and firm to the touch. 7. Remove and let cool!